After swaras emotional burst out uttara has convinced me she will look after swara when I am in office. Even though I don’t want to leave her alone I need some alone time to process all these as soon as I reached office I had seen sanskar and ragini having one of their moments I don’t get it is it only in my head or when every they are together they have these filmy moments as if even universe want them together. I just want to mind my own business but by noticing the surroundings I decided to interfere so I knocked on car window, rest of the time I was in my own turmoil thinking what should I do. As we entered the office sankar asked for the report that ragini had to prepare and announced she will be working like seriously if he had to do it this way the challenge and stuff is just for people to see. Did he even look into the report I don’t know I was getting angry each second may be I was guilty and everything around me is seemingly wrong. Ragini tried to make a conversation but I don’t want my anger to burst on her so I had simply avoided her. Later sanskar was saying something about project but my mind is not allowing me to concentrate so I told him I way not be able to continue because of another project in our company although that’s not totally true. I need to do something to make this situation better without hurting anyone. When I reached my office I got to know from my PA that dad was planning on cancelling the joint venture we had been working on with karma industries ofcourse i should have expected this after yesterday, he can’t see swara hurt now he is going to ruin everything on the way to hurt sanskar can’t this day get any better yet again I am in my own world thinking whether I should help sanskar or let him be as he deserves this. Finally I had decided to stay out of it as any time I need to choose between my family and other it will always be my shona. My heart is screaming I should be on the right side of this it’s not sanskars mistake if he choose ragini over swara in that matter maybe he never get anything towards swara nor we had asked him beforehand but I decided to stay put. Ragini is happy as she will not be forced to leave but also confused how she is going to handle gododias if they hate her for being sanskar girlfriend. She gets a call from laksh asking what happened after he left she informed him about sanskar and her becoming friends. “so everything is sorted right then why are you still sounding dull ” laksh asks but she decided to not say him about how they are going to pretend that they are in relation as sanskar told laksh as soon as he feel right he will disclose his family the truth as laksh was not happy about them lying because of him. “I was feeling alone as if I am trapped in the cage with animals but their are people working as if this is their last day on earth ” she said making laksh laugh. “that’s good you are not having work I am feeling bored so I will be coming to pick you up we are going to explore kolkatta k” he says “k done I will be waiting for you “she replies happily. “Before laksh comes I will see what sanskar is doing “she thinks and was about to go into his cabin but was stopped by Ajay as sanskar is busy and said not to disturb unless it is urgent. She was going to return to her seat but stopped when she gazed every one are looking at someone, Few with fear, few with jealous and few admiring her. Is their someone who is more scarier than sadoo maheshwari in this office she thinks looking at the people who are scared and turns in the direction of that someone. “oops sry I had not seen you coming “ragini appologises as she was about to collide with that person making them rather her jerk a step back. “how dare you don’t you have sense” the girl growls. “look I said I am sry” ragini says getting angry but stays calm as she thought to stay low if she had to survive here “whatever who are you I had never seen you before” she asks with a attitude. “new joining, welcome back kavitha mam.you are about to come tmrw you are here early ” Ajay comes being a Savior or else this kavitha is going to get a ear full. “that’s non of your business, where Is sanskar ” kavitha asks for which Ajay say he is working and asked not to disturb him . “that’s for the other employees not me I am his friend and also manager of this company so move and new girl take my bag keep it in my cabin “kavitha says by each second ragini is controlling not to burst out. “I am not working under you to do your personal stuff I am working for this company as you so do your own work “ragini says shocking every one. “hey don’t you know whom you are talking to “aditi say intervening. “she got attitude issues.give it to me kavitha mam” veni says taking kavitha bag as if it is some prasad in order to impress kavitha .the most important rule of karma industries is not to come on bad side of kavitha sharma in order to survive but ragini is deeply emerged in the bad side already. By then sanskar comes out completing his work “what is going on here and you where is your mobile laksh is continuously calling me as you are not lifting your mobile he is waiting for you down “sanskar says which confuses them. Ragini was about to reply but before she does kavitha says “laksh came to meet me but how did he know I was coming today I was just surprised you know we never talked before “kavitha says as if she was trying to figure out why all of sudden sanskars brother want to meet her whereas sanskar and ragini looks at her as if she’ll had grown two horns. “exactly why would he meet you”he says looking at kavitha “ragini go fast before laksh calls me once again and you both wait till I come we three will go home together I had something’s to talk “sanskar says irritated because of work.”k but can’t you say that normally why to keep that sadoo face ” saying ragini goes from their angrily. “now I need cool her down again “muttering sanskar leaves. Kavitha is burning in jealousy while aditi and veni are confused as usual. “sujatha are you sure what if sanskar doesn’t like it ” ap asks sujatha. “come on jiji sanskar is not in right state of mind but once he understands swara is better in every term than ragini in future he will thank me for doing this ” sujatha says confidently. “but papaji told not to talk on this matter but here you are calling pandit ji and all. Even chote papa will not like this what we will say to gododias we can’t raise swaras hope when we don’t know what future uphold ” pari says trying to convince sujatha. After ragini making a joke on her at breakfast sujatha had called pandith ji asked for muhrath for engagement of swara and sanskar .she is arranging pooja in which she is going to emotionally blackmail sanskar into accept swara. She knows her son can say no to them but he can’t play with family reputation so she is going to corner him in order to accept the proposal and once they get engaged she is going to get rid of ragini once and for all. But in order to keep her plan in motion she need to convince both her family and gododias. Here pari and ap are not able to make sujatha stop with her wicked plans and she also taken a promise from them not to disclose her plan to anyone. After making a plan she went to meet parvati gododia and her husband who are staying in ashram in a village near to kolkatta as they want to spend some time away from city in fresh air. Parvati is a strict and dominative women she always had her ways to make people do as her wish now when even ap and pari also not supporting her she had no option but to take help of parvati. As parvati is strictly against love marriages and it was even her choice to make swara and sanskar get married sujatha was positive. Here laksh and ragini visit some places laksh share his stories when he visited them with his friends or family ragini tell him about her life in mumbai and her pranks about janki, riya, sanju, suraj and how much she miss them. She also tells him she had not talked to them except suraj after coming to kolkatta as she fears if she talk to them then she will not be able to stay away from them. She also tells him about her brother as she trusts laksh and as sanskar always busy and all she can take laksh help but not about siddhant. He convinces ragini to talk to janki as she misses her if she don’t talk to her janki may feel lonely for which ragini agrees. Ragini calls janki but no one lifts so she thinks of calling afterwards. They decides to pick uttara as they were near her college. He tells how he and his siblings are from same college though of different groups now even uttara is same and even swara. When laksh mentioned swara ragini observed little tint on his face he sounded happy. She knows that because it’s the same when suraj and sanju share their feelings about each other not knowing about each other. “why are you smiling “laksh asks breaking her trance.”nothing just I am happy.shouldn’t we call uttara ” ragini smiles. “no need she will be waiting in canteen after her classes she called me mrng to pick her up as she came late to her calsses so she need to copy notes” laksh says. After what happened mrng I am in no mood to attend clg I also wanted to stay with swara to give her moral support after I assured to look after her to sid bai, but swara wanted to be left alone so here I am copying notes of missed classes and sahil and his friends are irritating me as usual but today swara is not with me I need face these idiots alone. “hey darling missing me “sahil says coming to my table and sitting beside me. “quit sahil I am not in a mood right now… “I was about to say his flirting he cut me of “but I will make you get into mood “saying he leaned near to me I don’t he was flirting as usual or he was trying to kiss me I was afraid so I slapped him and was about to leave by collecting my books. He was angry and shouted “how dare you I was being friendly and you slapped me now I am not going to leave you “saying he was approaching me nobody dared to stop him everybody are just watching if sahil is son of minister I am also daughter of maheshwaris it want to shout but my voice is stuck in my trought. Sahil was about to lay his hand on my shoulder but was stopped by another hand thank god it’s laksh boy I was beyond releaved I immediately hugged laksh bai In fear. Laksh bai punched sahil releasing me from hug and with that they starts fighting. Out of nowhere Sahil frends also joined the fight one against five that’s unfair. Even though laksh bai gave a though fight they are overpowering him then came ragini I just realised she also came. She grabbed hair of the guy who was about to hit bai from back and punched him. Before he comes out of shock he got a kick from her. As much as I had not appreciated her presence in our lives I am loving her. Bai and ragini were full on into hitting them and throwing punches when serious fight turned out to be funny I didn’t get it and next moment we all are in principle office. “out of all this is so unexpected of you laksh you are not only brother of uttara you are also ex student you need to know this is against rules “principle said disappointed . “but sir sahil misbehaved with me that is why bai interfered “uttara tried to convince. “no sir uttara is trying to protect her brother we were friends, laksh misunderstood and punched me “sahil defended himself. And ragini is standing their watching what is happening as this is common for her everytime she gets into trouble they call janki and she gets a long lecture from her. “I don’t know who is telling truth both of you call your parents “principle warned. “oh no mom is going to kill me “Uttara mutters audible to ragini and laksh. “papa will hang me to death for being a bad influence on younger sister “laksh says scared. “we are not wrong so don’t worry “ragini says “principle is not believing what we are saying how come our parents believe us if I say sahil is torturing me from many days mom will do my marriage tmrw only ” uttara says scared. “what I am going to kill that sahil you are saying this now. You need to tell this to principle “laksh says angrily. “bai please now is not the time .sahil was irritating but he never crossed his limits except today. So please leave it for now and think solution for coming out of this mess” uttara says. “k fine my brother is coming ” they hear sahil saying. He was shooting dragers at ragini and laksh. “I got a idea “telling ragini messaged someone . “now any one answer me what the hell happened ” shouts sanskar. While ragini, laksh and uttara Standing by bending their heads. “because of you guys I needed to write apology letter seriously I had never done it even when I am student “he roared. “calm down bai I am telling you we are not at mistake “Uttara tried to convince. “what happened then tell me dammit “he shouted Uttara was about to reason it but ragini shouted “don’t you dare roar at us like we are your prey we are having fun but these principles always make it a issue. Call your parents as If we are still children. Me and laksh are not even students of This college “she says taunting for which principle is shocked he excuses himself and they come out. Sanskar is giving ragini death glare. “so you are talking about ragini “they here a voice and turns to find jai with Sahil. “Jai what are you doing here and how do you know ragini “sanskar asks shocked. “actually I met her with sid in the restaurant I asked about you man but I never thought we will be meeting like this. Sahil with whom ragini and Laksh fought is my brother “jai says. “I also not thought you had a brother like sahil “ragini says for which she will get shut up look from sanskar. “sry we will wait outside “saying she drags laksh with her. “sahil told me what happened sry uttara if you felt offended he was just being friendly ” Jai says. “it’s k ” she gives half smile. “I am going to meet principle come sanskar let’s sort out the mess our younger siblings created ” jai says sanskar leaves halfheartedly as he didn’t liked the way sahil is looking at uttara he understood what might have happened but he didn’t want to create more sene as once jai was good friend of him and sid though Last few years they were not in contact. “so you had not told your bro’s about us “sahil says as soon as they leaves. “for the last time sahil their isn’t nothing between us I am being silent because I don’t want anything that happened today to repeat ” saying she goes near laksh and ragini who are waiting for sanskar. “Jai you continue we will make a plan to meet soon” sankar says after they assured principle they will make sure their siblings not repeat their mistakes. “k so ragini how do you know her sid was telling some family friend and all “jai Asks suddenly interested in ragini which irked sanskar. “she is my girlfriend and she is staying with us ” sanskar says as if it is casual. “k sanskar nice joke “jai laughs not believing him which irks him more “there is my family who believe in something even he never told but this jai is not believing him even he himself is saying it does he like her no that’s not happening she is my girl though we’ve are just pretending but I don’t like to even think of it ” sanskar thought. “I am telling truth even my family knows about our relationship “sanskar says more confidently and bids bye not able to tolerate jai shocked face. “sahil wait ” sanskar stops sahil who was about to leave. “yes sanskar “sahil pretends as if nothing is wrong. “just stop pretending everything is alright even Uttara is not saying anything I understand she don’t want you near her and even I don’t want you near her. 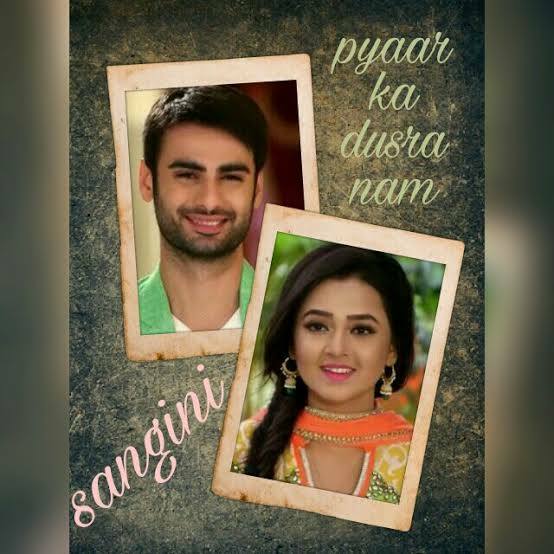 Don’t you dare trouble her again you will see the worst of sanskar maheshwari and trust me you are not going to like it so be careful “sanskar says with a smile as jai was still able to see him so not to make any sene “now like a good boy go to your brother who is waiting for you “saying he dusts sahil shoulder which only makes sahil smile turn into frown. Ignore typo’s. Sry for no ragsan senes but need some drama to go ahead of the story. you will get a lot of their senes more in coming parts. Thank you everyone for still reading and supporting. Do continue reading and supporting love you all guys. The post pyaar ka dusra nam – Sangini episode 18 appeared first on Telly Updates.